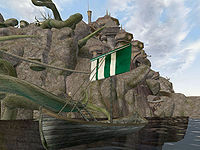 The Canyon Crawler is a ship owned by Selothril Llana, that operates between Marog and Helnim. In contrast to most of his fellow shipmasters, the dock near Llana is empty - no goods get in the way of passengers boarding his ship. The name of the ship is only mentioned in dialogue, where Selothril Llana tells you "My ship, the Canyon Crawler, can take you from here in Marog to Helnim, and several other places." This page was last modified on 6 March 2019, at 07:32.